Doesn't that look good?! Oh Pumpkin Fluff, you complete me. But before I get to talkin' about this amazing recipe, let me say a few things about blogging. Stick around, I promise it won't take long! Blogging is amazing. Ok, I'm done. HA-kidding. Let me elaborate a smidgen. For those of you who blog, you know what I mean. For those of you who don't, you should think about starting your own blog. When I wrote my first post, I had no clue how many doors my blog would open, how many people I'd meet, and how many things I'd learn. Even though I've only been blogging for about three months now, I feel like it's been three years. There is so much that I've learned, from setting up this blog, to quick tips for posting each entry, to photographing the recipes I make (I still have a longgg way to go on this, but at least I'm making improvements! ), to meeting people and making friends in the blogging community, to writing my own HTML code, and everything in between. And on top of all of the things I've learned, I've enjoyed every second of it. Who knew reading about HTML code and food photography could be so much fun?! While I could go on and on about all of the things I've learned and all of the things I love about blogging, I promised you this would be short. So, let's get to the point: one such instance of a door that my blog has opened for me is meeting fellow bloggers who have similar interests. One way that I've been able to meet other bloggers is through this really cool program called Foodie Pen Pals. The gist of this program is each month you are assigned a random person to mail any food or food related items to. You contact that person to get an idea of things they like/don't like and if they have any allergies, then it's all up to you to put a cute little package together and ship it off to them. And while you are putting together a special package for your Foodie Pen Pal, another Foodie Pen Pal is creating a special package just for you! Not only do you get to meet two people, but you get to put together a package, and you receive a package! September was my first month participating, and I'm definitely signing up to do it again. And YOU can participate! Even if you don't have a blog, if you love meeting new people and trying new foods then you should look into it. If you need one more reason that you should join Foodie Pen Pals, check out the awesome package that Brooke from Brooke Not On a Diet sent me! I swear, this girl and I must have the same taste in food because I love everything in my package. And now circling back around to the Pumpkin Fluff. Thanks to Brooke, I've discovered a new favorite dessert! This Pumpkin Fluff recipe is exactly what it sounds like: a fluffy, light, sweet, pumpkin mousse that is absolutely heavenly. If you are a fan of pumpkin, you must try this. 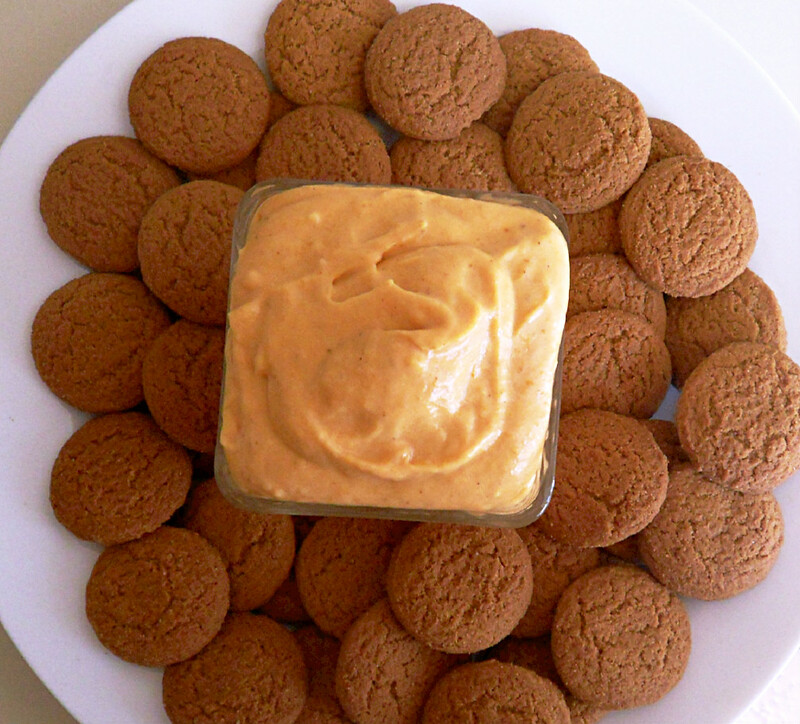 Eat it plain, dip gingersnap cookies in it, or keep things skinny by dipping fresh fruit into it. No matter what your mode of eating it is, you won't be able to stop at one bite. But lucky for you, it has less than 100 calories in a 1/2 cup serving. So, go ahead and eat away! Now excuse me while I go get my third Pumpkin Fluff serving today. Add pudding to a large bowl. Whisk in cold milk. Whisk for 1-2 minutes, or until pudding is set. Mix in pumpkin puree and pumpkin pie spice. Fold in thawed Cool Whip. Refrigerate for 10-15 minutes before serving. *Use any flavor you want, but vanilla and cheesecake work well! In this recipe I used one of each and it turned out delicious. **Do NOT use soy or almond milk; the pudding will not set. AH! This looks so fun. It looks like you got lots of yummy things! I love blogging because of all the fantastic people you get to meet! What a LOVELY package! 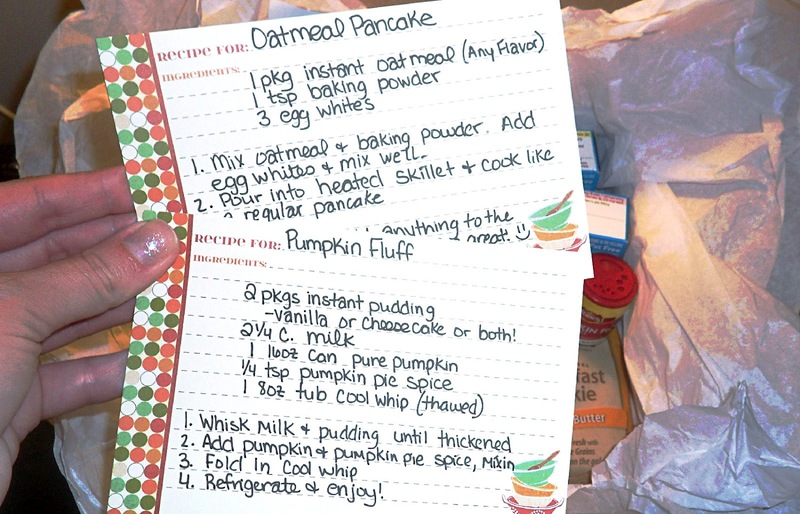 That oatmeal pancake recipe caught my eye. Your pumpkin fluff looks SO good. 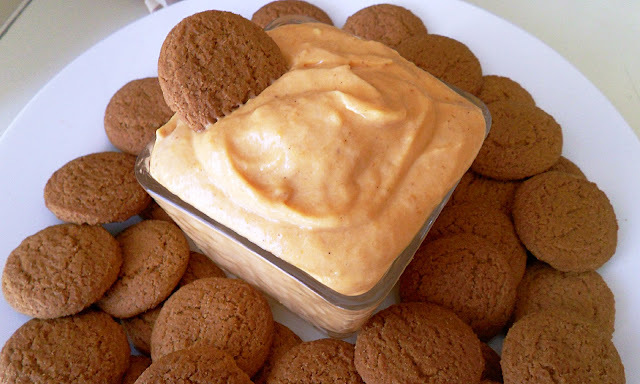 I love pumpkin dips, especially for apples and bananas. Isn't it a great package?! 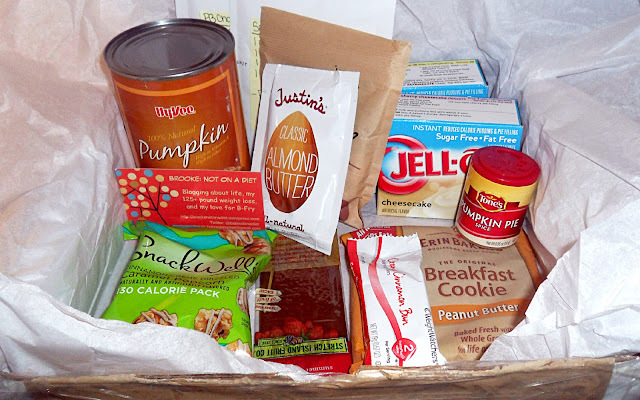 I love that she sent me so many things to try, and a couple of recipes to make with some of the items she sent. I haven't tried the oatmeal pancake recipe yet, but I'll definitely let you know how it turns out. And the pumpkin fluff IS so good. Super easy too! Thanks for posting the link, I just signed up and I can't wait! That's great! It's a lot of fun and a great way to meet people. It's also a great way to find out about new blogs. You're going to love it! Yay! Glad you enjoyed your box, I had a lot of fun putting it together! LOVE this post!! I just started blogging in August myself...found you at trick or treat tuesdays. You signed up for onlineblogcon yet? Thank you Shiloh! And yes, I signed up the first day haha. I'm so glad that Dorothy and Ashton decided to put this together. Can't wait to see what it's all about! Oh that's a great idea! I know this fluff is delicious with gingersnap cookies, so I can only imagine that it'd be great in a graham cracker or gingersnap crust. I might have to try that :) And don't you love FPP? I'm so glad that I discovered it! You got a box full of great goodies!!! I love blogging and meeting so many people who understand what I like to do:-) That pumpkin fluff sounds super delicious!!! Thank you Jocelyn! And meeting other bloggers and people who have similar interests is one aspect of blogging that I really didn't expect, but it's one of the best things about blogging! I think I'm going to make this next weekend! Can't wait to try it! !